Shades of Springsteen’s Nebraska bristle within Lewis’ subtle yet stunning compositions. He gently plucks his acoustics, touting a bluesy swagger with a touch of reverb. Throughout L’Amour, the virtually unknown artist plays pianos and guitars organically with an eerie sense of complacency, produced at a gentle pace like a somber ballad. This patient mode of production helps aid the most noteworthy aspect of Lewis’ instrumentation: his use of synths. The album’s entirety will make fans of David Lynch’s Twin Peaks feel nostalgic. The synths retain a faintly ominous, albeit frequently playful, quality to them that casts a lush shadow on the other instrumentation – much like Angelo Badalamenti’s early work with Lynch. Lewis tends to let the synths evolve around brooding acoustics, unlike Badalamenti’s heavier emphasis on the low-pitched twangy bass. Essentially, L’Amour sounds like Springsteen collaborating with Badalamenti in the late ‘80s. It’s all the more stunning considering L’Amour was released in 1983. 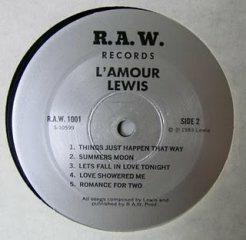 Lewis’ only release is remembered today as an overlooked gem that helped push solo singer/songwriter material from an era of gushy ‘70s pop into a more mature, emotionally vibrant range. Lewis’ personal history is a complete mystery. He dropped off the face of the earth after the release of L’Amour. Some say Lewis may still be living in California. 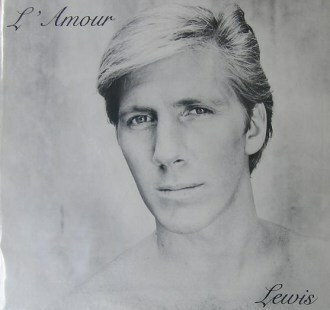 Others say Lewis was a reputed scammer and con artist who fled after not paying for L’Amour’s production costs. Or maybe he was an alien from another world. All these theories have similar credibility at this point, simply because no one really knows anything. Perhaps, considering the ethereal and otherworldly quality of his music, it’s for the better. There’s no doubt that it adds to the enigma. Whether or not that’s the way Lewis wanted it… who knows? His personal fate will probably remain lost forever, but his music will certainly not take the same path. The gorgeous “Even Rainbows Turn Blue” is a stunning instrumental, aided solely by an acoustic guitar and whimpering high-pitched synth. The guitar progression is dripping with sorrow propelled even more by the backing synths, which resemble strings in their swaying pad-like approach. As on all tracks here, there is a noticeable vinyl crackling in the mix. Budget recording or done for effect? Again, we’ll never know – and it doesn’t really matter. “Even Rainbows Turn Blue” shows how strong songwriting can shine even under harsh circumstances. Much like the guitar lead here, some of Lewis’ most interesting pursuits include little more than the draining synths and a singular instrument. Other than guitar, piano shows dominance, notably on tracks like “Love Showered Me”. Here, a spacey synth with a prominent phasing effect twinkles over a gentle piano melody, which travels for a minute before Lewis’ caressing voice emerges. A highly idiosyncratic presence, his fluctuating range and bevy of emotional cues brings comparisons like Nick Drake, Bob Dylan, and Arthur Russell. It’s as oddly and frailly beautiful as the instrumentation that surrounds it. “Romance for Two” – lovingly inspired by Christie Brinkley – is another piece of beauty. “Can’t take my eyes off you,” Lewis sings. “What can I do?” It possesses a very minimalistic structure, essentially repeating the same verse for four minutes with subtle variations in the backing synth and Lewis’ vocal tones. Still, “Romance for Two” is one of the most hypnotizing songs I have ever encountered. Just like the songs on Nebraska, this is one of several efforts on L’Amour in which the melody gets stuck in your head for days. This unpredictable and very subtle infectious quality is perhaps most noticeable on “Cool Night in Paris”, which struts a bluesy twang with a swanky fluctuating synth. Lewis’ cool-as-all-hell demeanor brings to mind Serge Gainsbourg, especially on this track with its sensual shuffle. It’s hard to even search for L’Amour on Google, much less find it in a store, as it hasn’t been pressed in nearly thirty years. So hopefully you’ll come across some links to download it. L’Amour is truly the definition of a lost treasure in music; it’s a release that went completely unnoticed at its time of release, only to be appreciated by a small but passionate following several decades later. There are an overwhelming amount of absolutely gorgeous songs on here so the recent surge is understandable. I just wonder why it took so long. A genuinely incredible record; best thing I’ve heard in ages. Thanks. is there any contact information for the R.A.W. label…? any clues about how to get in touch with whomever holds the rights?